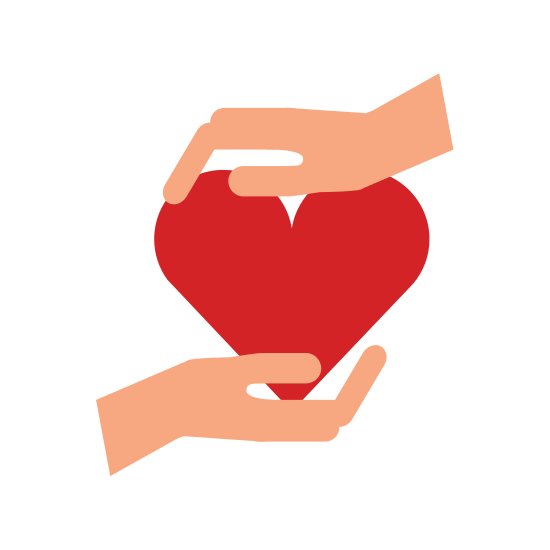 Everyone can have an impact on #GivingTuesday! DONATE and Make an impact now! For more than 45 years, CMP has been proudly serving the immigrant and low-income community and helping them toward gainful employment or become self-employed. Every year our Campaign for Self-Sufficiency raises funds to directly assist more than 3000 individuals in getting job skills trainings, work readiness sessions, job placement services, or small business startup seminars and assistance. With your help, our 2018 Campaign for Self-Sufficiency is aiming to raise $50,000 to continue and expand services to the greater community. $1,500 will help 1 low-income individual learn new job skills and become a certified nurse aide. $1,000 will help 1 unemployed individual learn freight forwarding operations and practical computer software skills to become a freight forwarder. $700 will help one entry level worker improve their employability by learning QuickBooks and basic computer skills to become a bookkeeper. $500 will help 2 new immigrants enroll in a 12-weeks English class and achieve 1 level of educational advancement. $300 will help send 1 aspiring entrepreneur to a 10-weeks Small Business Boot Camp. $150 will support 1 non-English speaker to attend a 6-weeks business training course in his/her native language. $100 will help award 2 young Chinese School students for their hard works and achievements. Imagine the impact you can bring ! 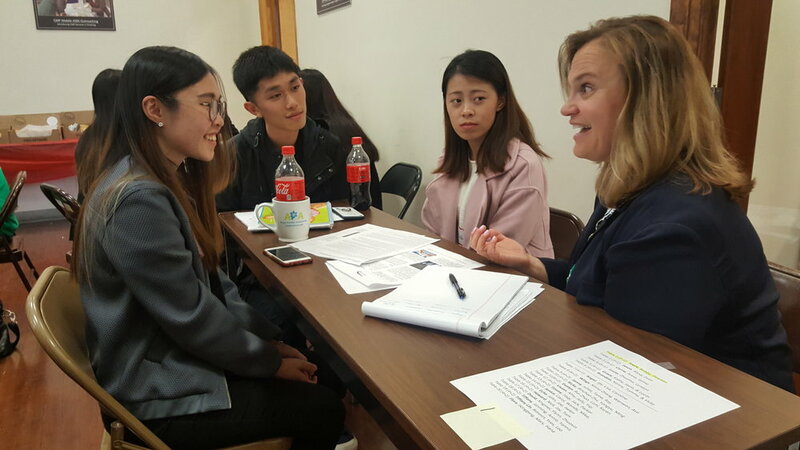 Here’s Yu Lin’s story: it offers a window into how difficult it can be for a new immigrant to develop the strength to obtain economic self-sufficiency in this new land; and how CMP helps him through it. When Yu Lin arrived at CMP in 2011, he’s been in the U.S. for only a week. Amidst being a new immigrant facing loneliness, helplessness, and fears, in 2011 Yu attended the Out-of-School-Youth (OSY) Program at CMP where he received training in job readiness, English writing and reading, math, and computer skills. CMP encouraged and assisted him to prepare for college admission. Equally important was that he got to know many good friends and started to build his social and support network here. 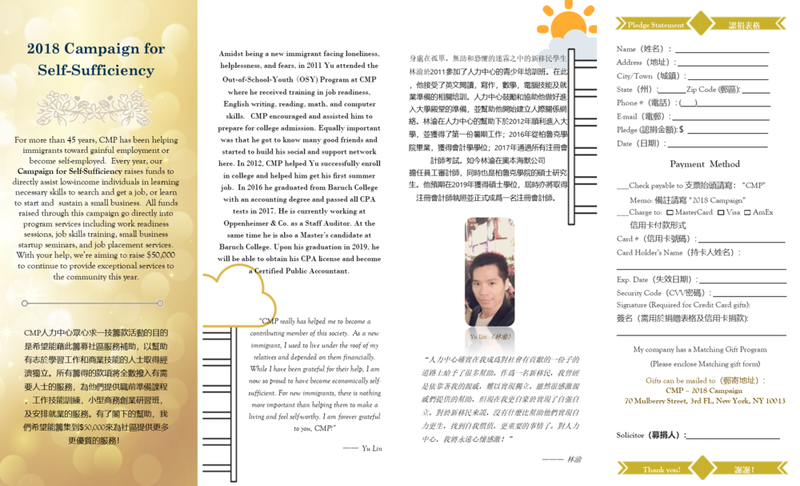 In 2012, CMP helped Yu successfully enroll in college and helped him get his first summer job. In 2016 he graduated from Baruch College with an accounting degree and passed all CPA tests in 2017. He is currently working at Oppenheimer & Co. as a Staff Auditor. At the same time he is also a Master’s candidate at Baruch College. Upon his graduation in 2019, he will be able to obtain his CPA license and become a Certified Public Accountant. The 2018 Campaign for Self-Sufficiency needs your support to continue to provide key services to the low-income individuals and immigrants like Yu Lin. 100% of your contribution will go to direct services.